The majestic Douglas-fir (Pseudotsuga menziesii, or commonly spelled Douglas Fir) can grow to a towering height of 120 meters or more. Two sub-species of this timber exist in abundance throughout western North America, the Coastal and Interior versions. Douglas fir sapwood is light in color while the heartwood, or center wood of the tree, is colored yellow to red-brown. This type of Douglas Fir timber dries quickly and is one of the strongest softwoods available for millwork and building. This species is excellent for showing off as floor boards, staircases, panelling, around windows and doors and is extensively used by the construction industry as structural lumber, as well as in the building of trusses. 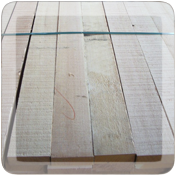 Square turning blanks, cabinets, structural lumber, paneling, marine pilings, window and door components, transmission poles, finishing boards, cutstock, patterned stock, veneer, boat masts and frames, general millwork.